Sock and Accessory Brands Global of Advance, N.C., is recalling about 14,500 infant caps sold in the U.S. and Canada. The button on the top of the cap can detach, posing a choking hazard. 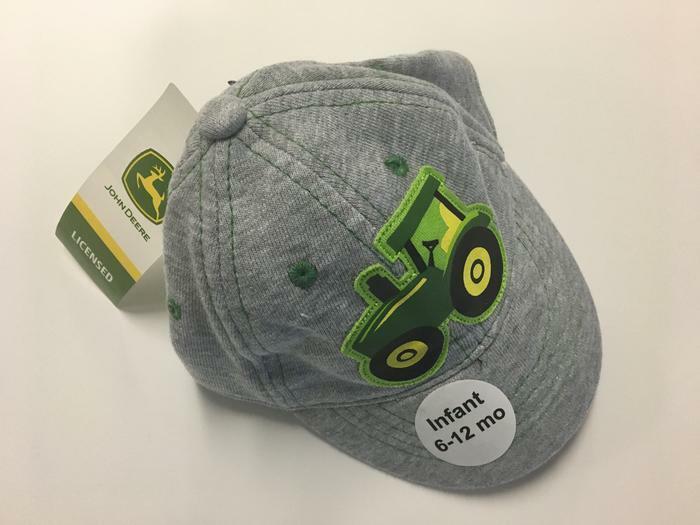 This recall involves John Deere gray infant baseball caps with a green tractor design. The caps were sold in one size (infant 6-12 months). Style number “JSH721HF ” and manufacture date 11/2016 are printed on the sewn in care label inside the back of the caps. The caps, manufactured in China, were sold at Tractor Supply Company and farm and ranch stores nationwide from January 2017, through March 2017, for between $10 and $16. Consumers should immediately take the infant caps away from young children and contact the firm to receive a full refund, including shipping cost. Consumers may contact Sock and Accessory Brands Global toll-free at 877-429-7637 from 8 a.m. to 5 p.m. (ET) Monday through Friday or online at www.wearsabg.com and click on Infant Cap Recall icon on top of home page for more information.